Nine people were injured after a drugged driver plowed into a crowd in downtown Fullerton after the midnight on Feb. 10, according to the Fullerton Police Department (FPD). 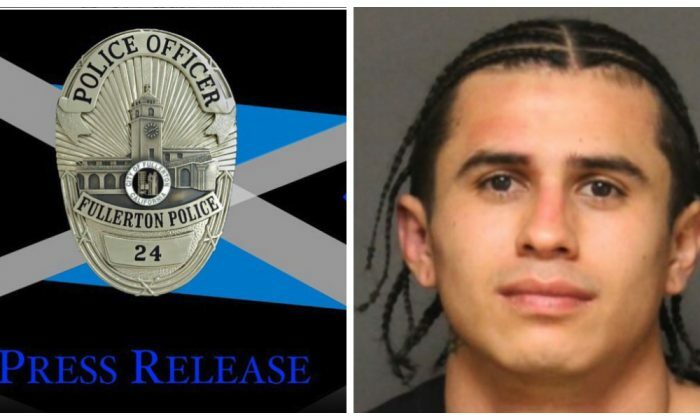 The suspect, 22-year-old Christopher Solis, who was driving under influence of drugs when the incident happened, has been taken into custody for “felony DUI causing great bodily injury,” FPD said in a statement. The statement also indicates that officers received calls around 1:48 a.m. reporting that a red Toyota Tacoma struck several pedestrians in the area of 100 W. Santa Fe Ave.
By the time officers arrived at the scene, they realized that the suspected vehicle had driven up onto the sidewalk, striking 9 pedestrians before hitting a tree and coming to rest. The vehicle was described as having serious front end damage with airbags deployed and smoke coming out of it. There were also people trapped under the car as it came to a standstill. A graphic video taken by a witness at the scene who was helping those injured shows that at least one victim was stuck under the suspect’s pickup truck while several others attempted to free the victim by lifting the truck. With help from a group of Good Samaritans, the first responders managed to rescue the injured. Police said a total of 10 victims, aged from 18 to 49, were taken to local trauma centers with injuries ranging from moderate to life-threatening. In addition, three other vehicles at the scene of the crime were damaged by the truck that Solis had been driving. Police said that hundreds of people were scattered throughout the area at the time of the crash, as bars and restaurants had just closed. ABC 7 reported that the incident had been initiated by an altercation when a group surrounded the truck and demanded the driver get out. “We’ve heard that there was an altercation or disturbance,” Fullerton Lt. Jon Radus told the Orange County Register on Feb. 11. Radus said the incident is still under investigation. Another witness told ABC 7 that the DUI suspected driver tried to get away, hit the car in front of his truck, then panicked and tried to flee in his vehicle. The authorities are urging people with information about this incident to contact the Fullerton Police Traffic Bureau at (714)738-5313. Another car-related incident in the Los Angeles area last weekend led to the closing of a Los Angeles Police Department (LAPD) police station after a vehicle crashed into the lobby. The incident happened around 4:45 a.m. on Feb. 10 at the LAPD’s Harbor Division station in San Pedro. Surveillance cameras captured a woman driving a white sedan, maneuvering around barriers only to come crashing through the glass doors and pulling up in the lobby. The woman then backs out, nearly knocking over an officer who had to dodge out of her way as she opened her car door. Police said the lobby was closed at the time and no one inside was injured. The driver and her infant passenger were also unharmed. The woman was later taken into custody. Officers are trying to learn what her intentions were to determine what if any charges need to be filed. A temporary mobile substation has been established since the incident to ensure that operations at the Harbor Division continue as normal.